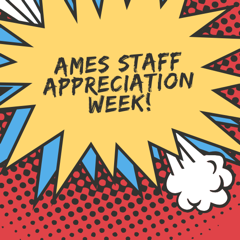 The Ames PTA is preparing to celebrate Teacher/Staff Appreciation the Week of May 6. The theme is “Super Teachers!” The week will feature special events and treats for the teachers and staff that work so hard for our children all year long. Teachers Luncheon – Parents are welcome to attend the Teacher Appreciation Luncheon on Thursday, May 9, at Ascension Lutheran Church from 11:00am-1:00pm. Lunch is provided for all the teachers and we ask parents to RSVP and pay $20 per person here by Thursday, April 18th. Gift Baskets – We are looking for volunteers to donate completed themed gift baskets to raffle off to the staff during the luncheon. Donate as a family or team up with others to create a fun basket. Please note, alcohol is not allowed. If you plan to donate a basket or have any questions please contact Susan Wolfe. Baskets are due by Friday, April 26th. Thanks for helping us make this an unforgettable week for our teachers and staff. We cannot do it without the help of parents and we look forward to showing the staff a little love for everything they do for our kids!